An unrecorded variant of Senex's large map of North America. An exceptional and influential 1710 British map of North America by John Senex. Hands down the most ambitions British mapping of North America produced thus far, Senex's large format map covers all of North America from the unexplored high arctic to Panama and the Spanish Main, including modern the day nations of Canada, the United States, Mexico, the West Indies, and Central America. 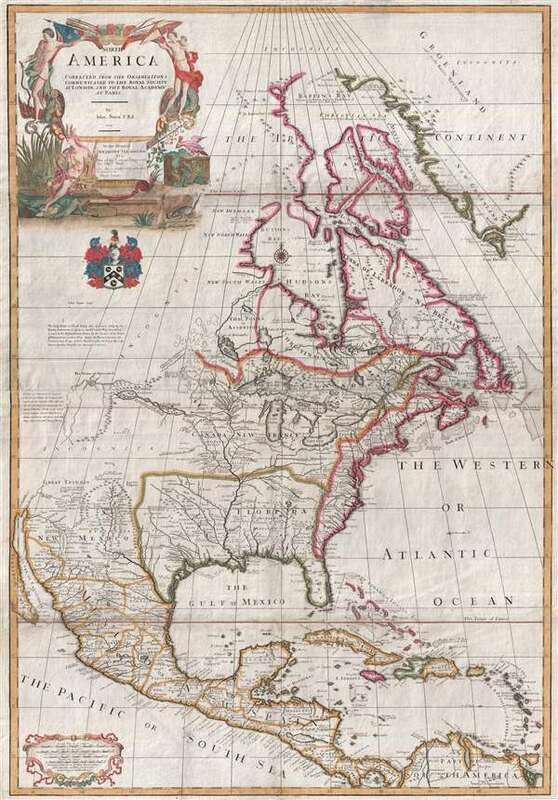 This map is primarily based on two 1703 maps by the French cartographer Guillaume De L'Isle's,Carte du Mexique et de la Floride and Carte de Canada ou de la Nouvelle France, which Senex consolidated into this singular large-scale English language production. This would have been among the first exposures of the British public to many of the new cartographic ideas about North America advocated by De L'Isle, including a peninsular California, the semi-apocryphal explorations of the Baron Lahonton, and the most sophisticated renderings of the Great Lakes and the Lower Mississippi basin presented to date. Politically this map surprisingly follows so slavishly on the De L'Isle model that despite being an English map, it strongly advocates for French political dominance of the Americas. The fact that Senex copied De L'Isle's political conventions throughout the map is a striking indication of the power cartographers wielded in controlling the destinies of distant lands in the face of competing colonial claims. Here Senex presents sprawling French territories extending from the St. Lawrence River to Florida and west as far as the southern Rio Grande. France thus controls all five of the Great Lakes as well as the important St. Lawrence River corridor. Moreover, France also controls the entire Mississippi Valley, Lahonton's speculative lands, all of modern day Texas, and Florida. The British colonies, which if mapped from an Anglo perspective held coast to coast grants, are here hemmed in by the Appalachian Mountains and hug the coast precariously. Spanish claims, likewise, which extended well into Texas, are here sacrificed in the favor a vast French land grab extending almost to Santa Fe - the capital of Spanish New Mexico. In the north, the lands of the Hudson Bay Company are identified as 'Christinaux or Kilstianau'. … the Baron Lahontan has invented these things, which is hard to resolve he being the only person that has travel'd into these vast countries. Lahonton himself was a French military officer commanding the fort of St. Joseph, near modern day Port Huron, Michigan. Abandoning his post to live and travel with local Chippewa tribes, Lahonton claims to have explored much of the Upper Mississippi Valley and even discovered a heretofore unknown river, which he dubbed the Longue River. This river he claims to have followed a good distance from its convergence with the Mississippi. Beyond the point where he himself traveled, Lahonton wrote of further lands along the river described by his American Indian guides. These include a great saline lake or sea at the base of a mountain range. This range, he reported, could be easily crossed, from which further rivers would lead to the mysterious lands of the Mozeemleck, and presumably the Pacific. Lahonton’s work has been both dismissed as fancy and defended as fact by various scholars. Could Lahonton have been describing indigenous reports of the Great Salt Lake? Could this be a description of the Missouri and Columbia Rivers? What river was he actually on? Perhaps we will never know. What we do know is that on his return to Europe, Lahonton published an enormously popular book describing his travels. Lahonton’s book inspired many important cartographers of his day - Senex, Moll, De L'Isle, Popple, Sanson, and Chatelain, to name just a few - to include on their maps both the Longue River and the saline sea beyond. The concept of an inland river passage to the Pacific fired the imagination of the French and English, who were aggressively searching for just such a route. Unlike the Spanish, with easy access to the Pacific through the narrow isthmus of Mexico and the port of Acapulco, the French and English had no easy route by which to offer their furs and other commodities to the affluent markets of Asia. A passage such as Lahonton suggested was just what was needed, hence wishful thinking more than any factual exploration fueled the inclusion of Lahonton’s speculations on so many maps. Just to the south of Lahonton’s cartography, past lands labeled 'Incognita', three of the semi-mythical 'Seven Cities of Gold' are identified. The most prominent of these is Great Teguayo (Great Teguaio). Teguayo was believed to be one of the seven Kingdoms of Gold presumed to be discoverable in the unexplored American west. The name Teguayo first appears in the Benevides Memorial, where it is described as a kingdom of great wealth. The idea was later popularized in Europe by the nefarious Spaniard and deposed governor of New Mexico, Don Diego Dionisio de Peñalosa, who imagining himself a later day Francisco Pizarro, promoted the Teguayo legend to the royalty of Europe. In the earliest records, Teguayo was said to lie west of the Mississippi and north of the Gulf of Mexico, but for some reason, Senex situates it far to the west. The city of Cibola, appears just to the south of Great Teguaio. Senex correctly associates Cibola with the Zuni - as described in the journals of the Coronado expedition. To the northeast, yet another supposed city of gold associated with the Coronado expedition, Quivira, is depicted. Quivira proved to be a Wichita village on the banks of the Arkansas River, and though indeed prosperous by the standards of the plains tribes, it fell short of Coronado's golden expectations. Just south of Quivira is an embryonic river labeled 'R. of St. Francisco', again based on information drawn from the Coronado Expedition. One assumes this to be an early reference to the Arkansas River, which Senex also maps more properly as a tributary of the Mississippi. This dislocation is hardly surprising given general confusion among scholars regarding Coronado's exact route. Just south of the river are the lands of the Tiguas, another designation derived from Coronado's journals. Most scholars, including Wheat, consider Senex's rendering of California, as well as De L'Isle's which it follows, to adhere to the peninsular model. However, our interpretation suggests that both cartographers were leaving the matter open to discussion. California is here presented more than half way into the printed borders of the map. When a cartographer does this it raises immediate questions. In this case, they are easily answered. By pushing California into the borders, Senex is able to detail the known parts of what is today Baja California, without delving too heavily into the more confusing territory to the north. He does not as most scholars suggest, advocate for or against the insular California question, but rather, through clever design, simply avoids addressing it - at least on the present map. In Canada, there is a very interesting mapping derived from Jean Baptiste Louis Franquelin's work appearing to the north of Lake Superior. After correctly mapping Lake Nipigon, the cartographer adds two additional lakes, Christinaux directly to the north and Assenipolis to the northwest. These he connects via a channel and numerous portages to James Bay. This is mostly likely an early mapping of the Albany River, which had long been visited by coureurs des bois and French missionaries who established the Mission of St. Anne at the mouth of the River. The Hudson Bay Company took over the mission and turned it into Fort Albany which is here identified using the French nomenclature Fort. St. Anne or Cree, Quichichoven – possibly based on De L'Isle's mapping. Lake Assenipolis is no doubt Lake Winnipeg, both for its recognizable form, and its connection to the Nelson River (here identified as the Bourbon River). Lake Christinaux is therefore most likely an early if misplaced mapping of the Lake of the Woods. There are a couple of additional elements of note. Sir William Phips' discovery of a Spanish wreck off the coast of the Caicos and Southern Bahamas is noted. The discovery and subsequent salvage of nearly 300,000 British Pounds of treasure made Phips a celebrity in England. Treasure hunting thus coming briefly into vogue, Senex doubtless recognized an opportunity for profit by including the discovery on his map. Senex also extended his map substantially further north than De L'Isle, thus increasing coverage of the Canadian Arctic and the Terra Incognita above Baffin’s Bay. The map is dedicated to Anthony Hammond, then a commissioner in Her Majesty's Navy, and whose armorial crest appears below the title cartouche. Senex must have believed that Hammond had a bright political future to so seek his patronage. It was not to be so. Hammond retained his position with the Navy but was stripped of his place in Parliament in 1708. A year after this map was published, in 1711, Hammond relocated to Span to take an appointment as deputy-paymaster for British forces in Spain. This position led to various pecuniary scandals forcing Hammond into early retirement at Fleet Prison, where he died in 1738. According to Stevens and Tree, John Senex first published this map in 1710 in conjunction with Charles Price and John Maxwell, whose imprint appears on the first state (1710a). The second recorded state (1710b) appeared in the same year, but with 'Cha. Price and John Maxwell' deleted and the 'T. Bowles 1710' imprint added. A third and final state (1750c), issued around 1750, features the 'T. Bowles, J. Bowles and Robert Sayer' imprint. The present example seems to be an additional unrecorded state, with the 'John Bowles and Son, in Cornhill and Robt. Sayer in Fleet Street' imprint. This map was published both independently and in various Senex atlases. Very good. Minor verso reinforcement. Else clean. Original platemark visible. Phillips (America) p. 566. Lowery, W., The Lowery Collection, 273. Tooley, R. V., The Mapping of America, (Stevens and Tree) #61, page 91. Wagner, H. R., The Cartography of the Northwest Coast of America To the Year 1800, #495. Wheat, C.I., Mapping the transmississippi West, #92. New York Public Library, Map Div. 97-6042. Shirley, R., Maps in the atlases of the British Library, SEN-1c. Reinhartz, D. and Saxon, G., The Mapping of the Entradas into the Greater Southwest, plate 6.45, page 193.